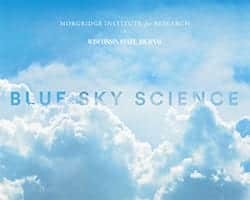 News & Stories > Blue Sky Science > How do rockets get past Earth’s atmosphere? How do rockets get past Earth’s atmosphere? Rockets that are launching things into space, like satellites or space probes, do have to get past the Earth’s atmosphere but don’t have much trouble doing it. Rockets encounter most of the resistance when they’re near the Earth’s surface. The higher up they get, the thinner the air gets, and the resistance pushing against the rocket gets lower. So for a rocket engine lifting some heavy weight into space, the work gets easier as it gets higher. Commonly you’ll see a rocket burn up its fuel as it’s propelled away from Earth, indicating a lot of work going on closer to the Earth’s surface. Usually a rocket has two gas tanks, and they’re both largely empty by the time it gets high above the Earth’s surface. And at that point, the engine is doing more work just to lift the empty gas tanks and the engines than it’s working to move the satellite or space probe. Because of the large amount of fuel needed at the liftoff and beginning of the journey, rockets are typically designed with two or more fuel stages. Each portion, or stage, of the rocket contains its own fuel and engines. In the first fuel stage, or booster stage, the fuel is used up and then that portion of the rocket is discarded. Then there’s a second engine and fuel stage that continues to propel the rocket. Sometimes a rocket will even a third fuel stage, depending on what it needs to accomplish. With each stage, the fuel is burned up and the used portion is discarded and drops off the rocket. The process can be complicated because of everything the rocket engine has to do near the Earth’s surface, but in general, the work gets easier for the rocket as it continues to climb.